That was quick. My first schedule change has happened before I even hit the trail for my first hike. The hiking season for the Sierras typically begins in mid-June and lasts through October. 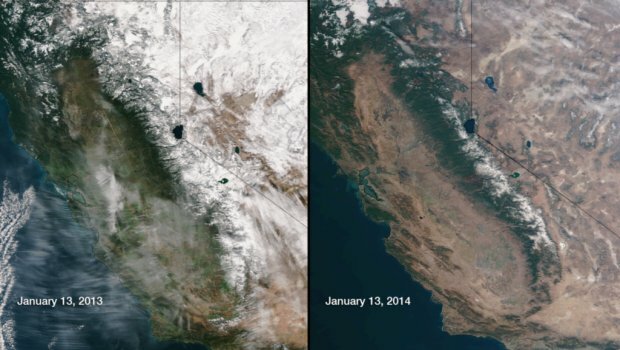 This year, however, California is in the midst of an extreme drought. The Sierra snow pack has been extremely low compared to historic averages and even recent drought years. Taking a bit of a gamble, I reserved a hike permit for May 24. I’ve been keeping tabs on the trail conditions since and snow levels remained low. This was great news for an early season JMT hike and terrible news for California’s water resources (see Explosion in Extreme Drought). As I was finalizing plans this week and prepping my provisions, I checked in again with the Yosemite Valley Wilderness Center (209-372-0740) to get an update on the latest conditions. Now, snow levels are up to 40 percent of normal. The JMT is 100 percent covered. A few late storms and everything above 8,000 feet is blanketed. Even more fun, the snow isn’t expected to break until mid-June. All that snow and I’m still rocking shorts. Old habits die hard. That leaves me two choices. Keep my scheduled start date, but slow the hike way down (12-14 days, instead of 7) to accommodate a tough slog through 222 miles of snow, slush and mud. Or push the date back until after the snow breaks and hope to get one of the few first-come, first served permits available in the park. I’m going with the latter. I haven’t yet figured out exactly what this means for my schedule. I have my eye on a flight to Lima next week. I might just bump my Alpamayo trek up a year and head to South America until it’s time for the JMT. ‘Cause why not? Good luck with the trip to Lima! If your goal is still to eat as much as you can leading up to the hike, Peruvian food is the best for that. Great meat and the best potatoes I have ever eaten. Good luck!